Interactive Tipping Tool – Are You Tipping Enough? Generally speaking, I don’t share a lot of editorial on FoodAskew. However, this was sent to me and I think it’s a terrific tool to know how to tip for various service industries. 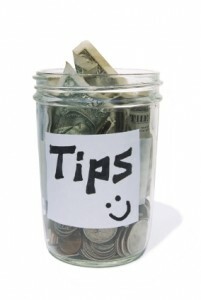 Most Americans are accustomed to tipping wait staff at restaurants, but there’s a lot of other areas in the service industry where individuals deserve a tip, but are often under tipped or not tipped at all just because the customer is unaware of how much tip is customary or that one is customary at all! Boom – that’s where you need to go. It’s interactive, so once you click on ‘To the Tip Guide’ at the bottom, you can select the general service area (restaurants, travel, cosmetics, etc) and narrow it down from there for the specific service. The tool will tell you the customary rate and even has a calculator so you can enter in the fee and what percentage and it’ll tell you the tip. This would be a fantastic app for my iPhone (hint, hint) but is still great if you’re dealing with an in-home service or know how much you’ll be paying ahead of time before your next service appointment. I’m happy to say that after checking out every service person I tend to use, I’m within range on the customary tipping scale, except for one – I’ve got to remember to pack some extra cash for my next business trip to tip the maid! I also seem to naturally be following all the basic rules except for one – if I received bad service, I won’t tip, regardless of whether or not I plan to come back. While tips are customary, I still believe you have to earn a tip and at least do a satisfactory job to get it. Thanks to HospitalityManagementSchools.org for creating this handy tool & sharing it with me to share with you!